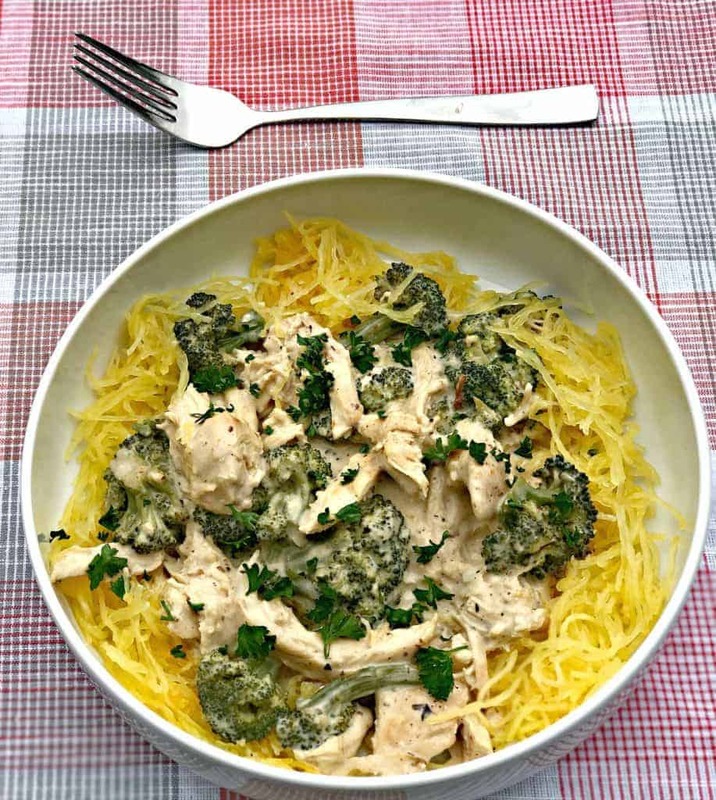 Instant Pot spaghetti squash chicken alfredo is the first dish I tried out with my new Instant Pot. I have been wanting to purchase an Instant Pot forever! Realistically, forever really means about 6 months. I finally purchased one and I’m so glad I did. Let’s start with what an Instant Pot is. 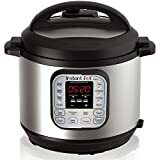 It is a multi-cooker that does the job of a slow cooker, electric pressure cooker, rice cooker, steamer, yogurt maker, sauté/browning pan, and warming pot. It’s a single appliance that does the job of seven different kitchen appliances or tools. 12 pre-programmed operation buttons (Rice, Multigrain rice, Congee/Porridge, Sauté/Browning, Soup, Poultry, Meat & Stew, Beans & Chili, Steaming and Slow Cook, Keep warm, and Yogurt). The pre-programmed buttons automate the cooking process. No more standing around watching and waiting for meals to cook. You can delay cooking (up to 24 hours) to plan ahead of time. You can use all of the pre-programmed operations, with the exception of saute’ and yogurt. I chose this recipe because I was originally introduced to the Instant Pot via a blog post I read about how to cook spaghetti squash quickly. I love spaghetti squash. 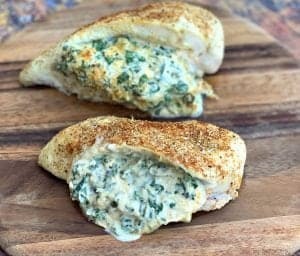 It is a wonderful alternative to produce low-carb dishes. Spaghetti squash can be INTIMIDATING. It reminds of the anxiety I get slicing whole pineapple! Tastes so good, but is it worth all of the work? The better question is does it really require a ton of work, or am I psyching myself out here? Nonetheless, I have an Instant Pot now, which should make the process painless. Here is a link to the Instant Pot that I purchased. Preparing spaghetti squash in the oven typically takes me 45 minutes. It took me 7 minutes in the Instant Pot! It took 4 minutes in the pot to get these results. I wouldn’t describe the taste of spaghetti squash as a true pasta substitute. I do not view most veggie pasta (zucchini noodles, sweet potato noodles, etc.) alternatives in that way. 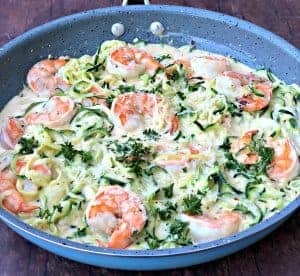 For me, this is a delicious way to enjoy a standard pasta dish, without all of the carbs, and it still tastes GOOD. 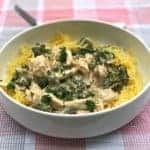 Instant Pot Spaghetti Squash Chicken Alfredo is a quick and easy low-carb recipe packed with creamy alfredo sauce and savory chicken. Cut the spaghetti squash in half, crosswise (not the long way). Add 1 cup of water to the pot. Place the spaghetti squash halves in the instant pot, with the cut sides facing up. Place the lid on the pressure cooker and cook on high pressure for 7 minutes. After the 7 minutes, quick release the valve at the top of the pressure cooker to lower the pressure. Remove the lid and the squash. Poke the squash to ensure it's tender. 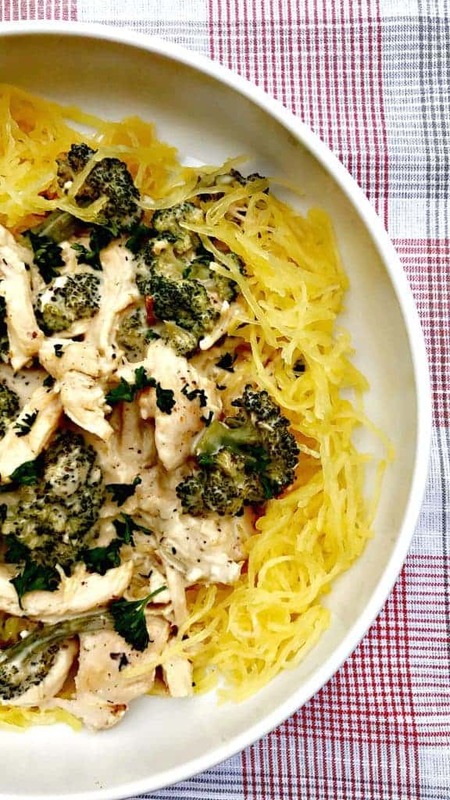 Shred the squash with a fork to create "spaghetti." Pour out the excess water from the Instant Pot. Turn the pot on the saute' function. Season the chicken breast cubes with the seasonings. Add the olive oil to the pot. When the oil is warm add the chicken. Saute' both sides of the chicken until brown and cooked. (about 3-4 minutes each side) Remove the chicken from the pot and set aside. Add the minced garlic and cook until fragrant. Deglaze the pot by adding the chicken broth. Scrub the brown bits from the chicken from the bottom of the pot. The brown spots and bits from the chicken are packed with flavor. You want to keep this! Add the almond milk, whipping cream, cream cheese, and butter to the pot. Stir until combined. 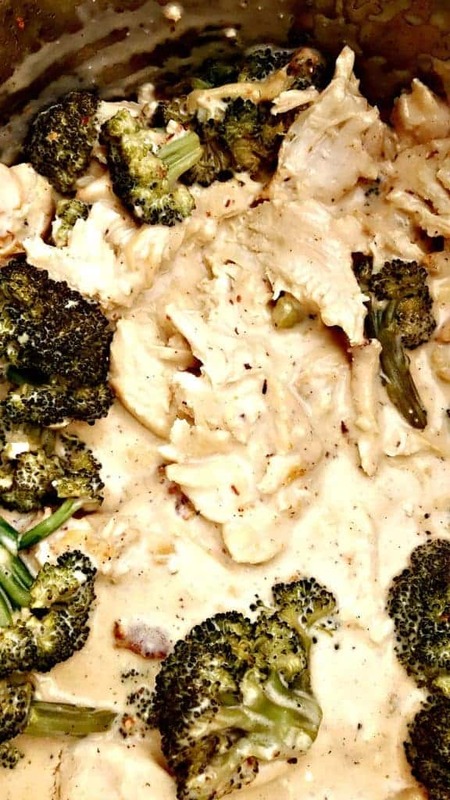 Stir in the broccoli and parmesan cheese. 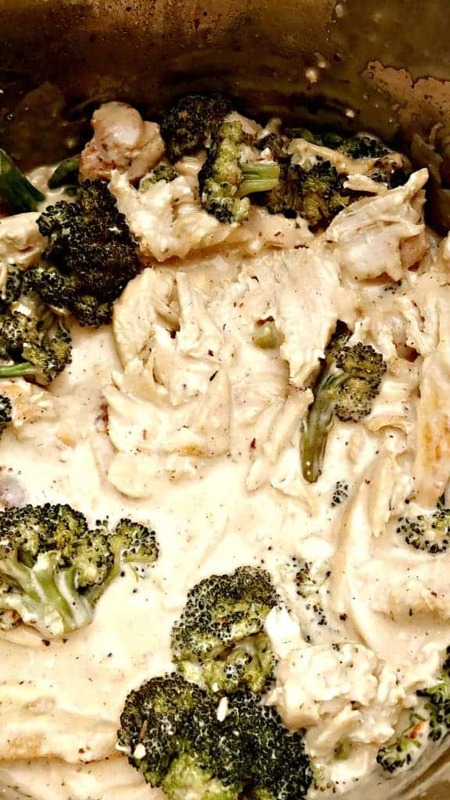 Cook for 2-3 minutes or until the broccoli is soft and the sauce begins to thicken. Add the flour to the pot and stir. This will thicken the sauce. (If you would like a thicker sauce, add an additional tablespoon of flour. This adds an additional 5 calories and 1G of carbs per serving). Add the chicken back to the pot. Mix well to combine. 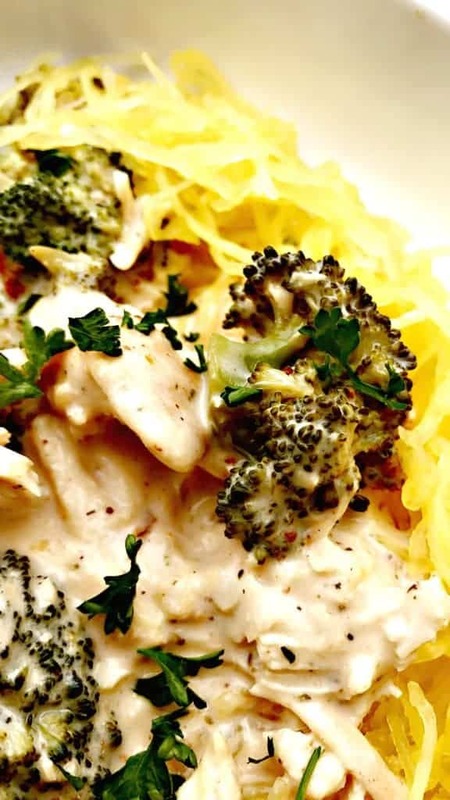 Serve the chicken and cream sauce over the spaghetti squash. These pictures are so inviting and recipe so healthy… I’d love to dive right in!!! I don’t own an instant pot, but now I want to! I just got mine Saturday. I’m looking forward to experimenting. This looks amazing. I have been wanting an Instapot forever. I finally took the dive! 45 to 7 minutes is PRETTY impressive…. i guess I’m going to cave in and buy one myself! Absolutely! I was dragging my feet, but so happy I caved. I keep seeing everyone use an Instant Pot, I think I need one… One can never have too many kitchen gadgets, right?? Exactly! Instant Pots are a huge trend right now. It took me 6 months to finally decide to get on board! 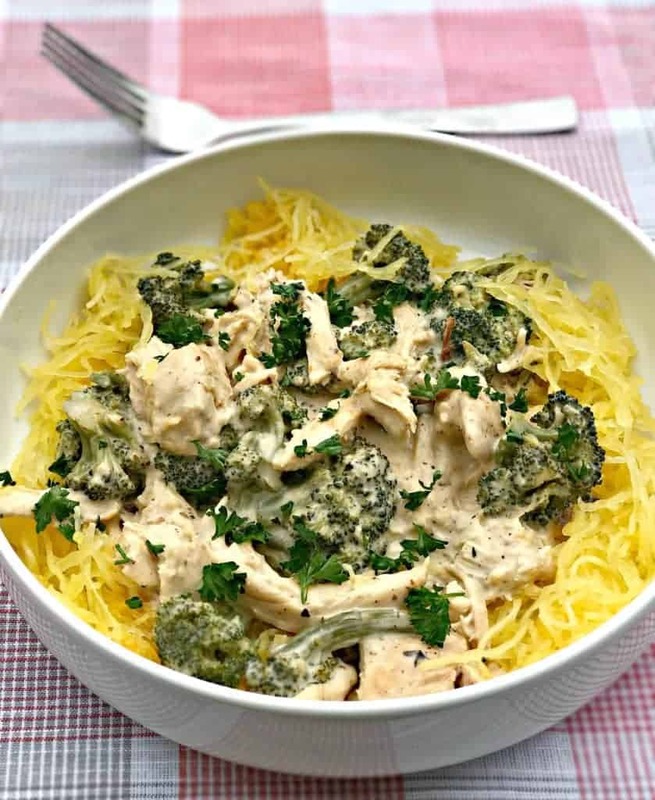 I love spaghetti squash– this looks like an amazing and healthy meal. I love that you are using almond milk for creaminess! I am lactose intolerant. Almond milk is so great. I’m glad it’s available as a sub for those who are lactose intolerant. I love any and all recipes that turn my favorite pasta dishes into healthier versions…but this one is made in the Instant Pot too! Ah! Sold! Can’t wait to try this ASAP! 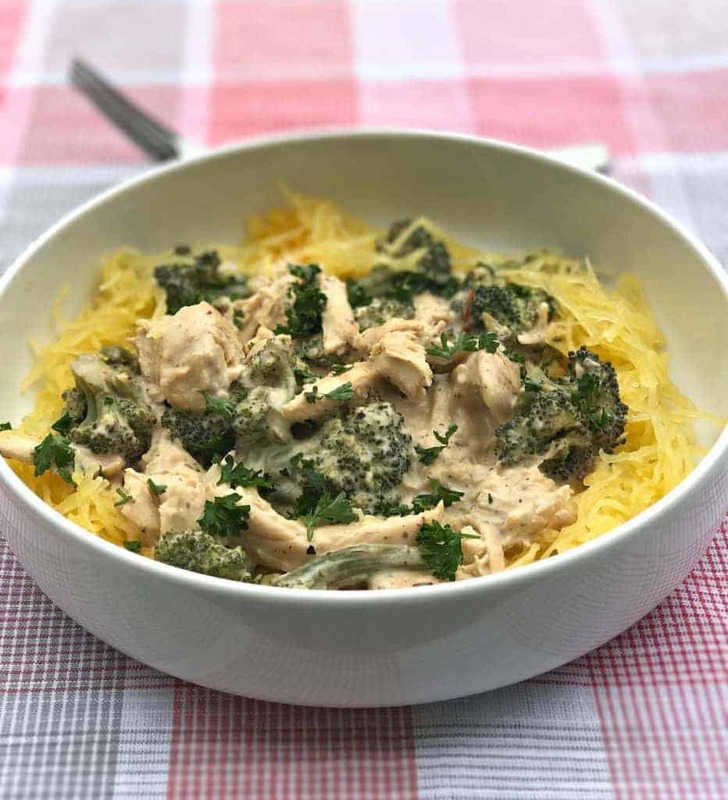 Love the idea of using the Instant Pot for the spaghetti squash! Isn’t that tool just amazing? And this dish looks so delicious, yum! This recipe was delicious, but I really don’t feel like it saved me much time. It was a 2-step process and having to wait for my Instant Pot to come back up to temperature seemed to take awhile. I followed the directions to a tee and the sauce came out broken, which was a little disappointing. That said, the dish is *really* tasty and having a way to make spaghetti squash in 7 minutes is pretty great! Hi there! Thanks for the feedback. 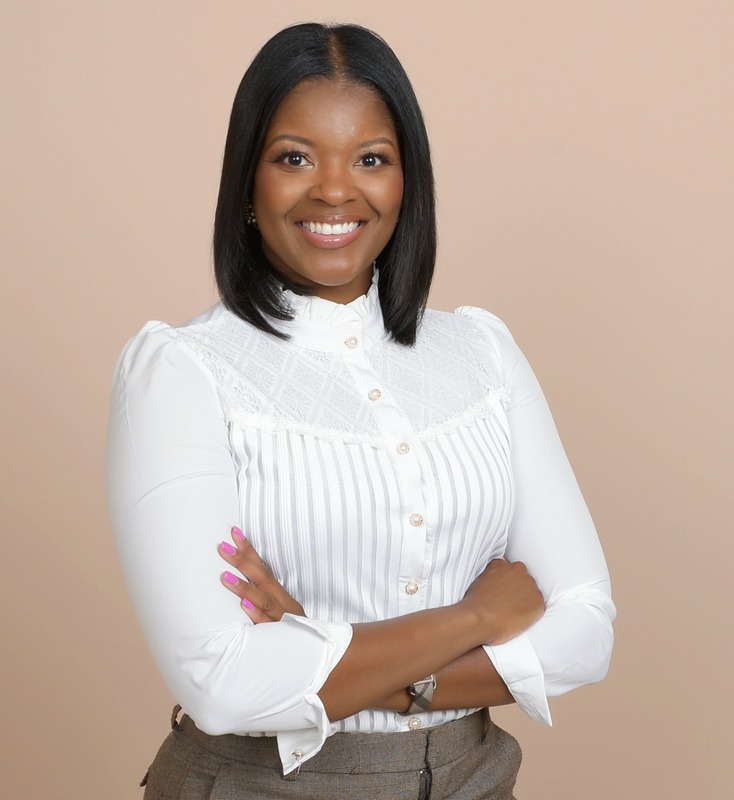 For me, my Instant Pot saves me time because I don’t have to babysit the stove while I cook. 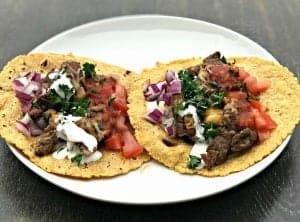 While it does take time for the Instant Pot to come to pressure with all Instant Pot recipes, I usually take that time to do other things, (i.e. laundry, catching up on emails, etc.) When you say the sauce was broken. What do you mean? When a sauce is broken, it means that whatever dairy products used separate and become grainy instead of forming a creamy emulsion. It usually happens when dairy is cooked at too high of a temperature. I’m not sure how to avoid it it a pressure cooker. Perhaps if I had used flour (recipe said optional), the emulsion would have held, but I’m trying to avoid gluten and extra carbs. It is SO GOOD, THOUGH. I’ll let you know if I can work my way around the broken sauce. Hi there! Thanks so much for trying the recipe. Definitely let me know what you find. I used arrowroot in place of the flour and it worked great! Hi this may be a silly question but when you say ‘add all ingredients’ in the last step, does that include the chicken and broccoli? If it does include the chicken, do you cut/shred the chicken first before putting it in the pot? I ask because that’s how the chicken is presented in the photo. Sorry I’m not a natural cook so I need realllllly specific instructions 🙈. Hi there! Yes, by add all of the ingredients I mean everything. I also mention that adding the spaghetti squash at this time is a matter of preference. 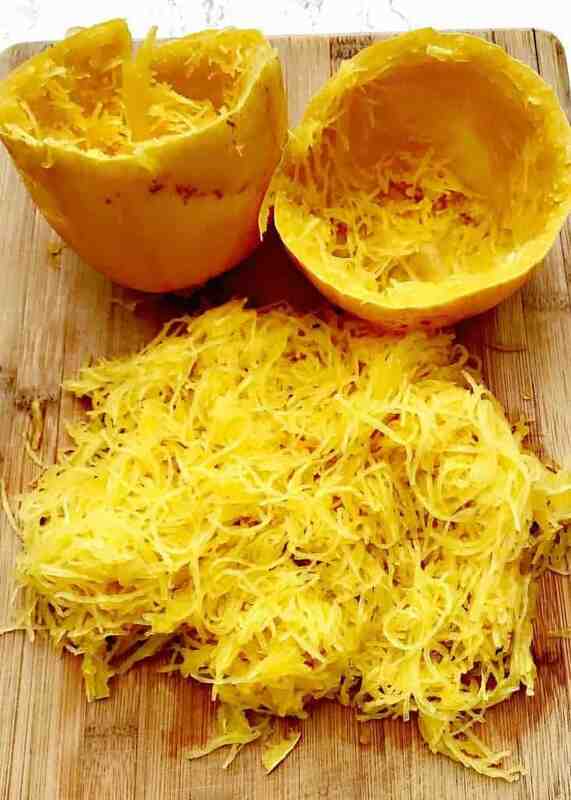 The spaghetti squash has already been cooked, but if you would like the squash drenched in sauce add it here. You can choose to slice the chicken before or after this process. Both will work just fine and I have done it both ways. This was really good! Quick and easy since most of the ingredients were on hand. My family really enjoyed the dish. What size Instant Pot do you have? I’m having a hard time imagining a whole Spaghetti squash fitting in mine cut across the middle and it fitting cut side down in my instant pot. 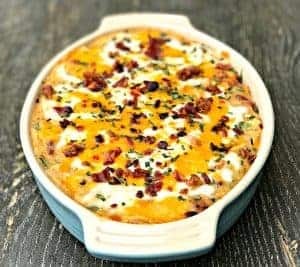 The pictures are amazing, but I couldn’t find the actual recipe anywhere! Please send me a lin,. Thanks. The recipe is above the comment section where you typed this comment. I’m so glad you enjoyed it! 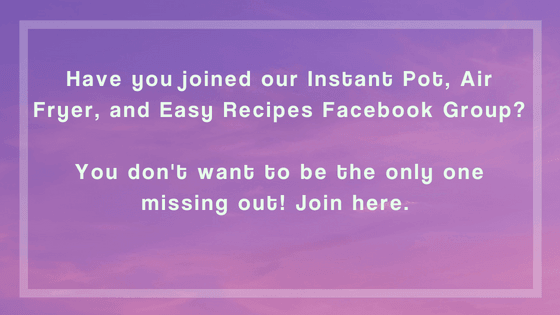 I hope you try more of my healthy Instant Pot recipes! This was delicious! Always looking for low carb/low cal recipes. Instant pot is a life saver! Hi there, servings are noted in the recipe card.